Metastasis, the process by which cancer cells leave the primary tumor and spread to other sites in the body, is responsible for more than 90 percent of cancer deaths. Thus, there is a significant need to improve the therapeutic options for patients who suffer from metastatic disease. 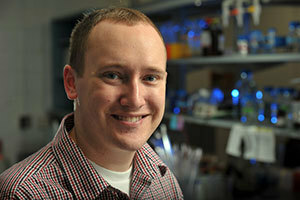 New research from the laboratory of Zachary T. Schafer, associate professor in the Department of Biological Sciences, Coleman Foundation Collegiate Chair of Cancer Biology and researcher in the Harper Cancer Research Institute at the University of Notre Dame, could lead to these new therapies. In order for cancer cells to metastasize, they need to shut off cell death pathways and simultaneously alter defects in cellular energy production. The researchers studied specifically Ras mutations. Ras is a proto-oncogene, which means that it is a gene present in normal, non-cancerous cells. When there are specific changes or mutations in the Ras DNA, this mutation can contribute to the development of cancer. While Ras mutations are most commonly found in cancers of the lung, colon and pancreas, Ras is the most commonly mutated proto-oncogene observed across all human cancers. While more research needs to be completed, the findings suggest that an effective strategy to eliminate metastatic cancer cells with Ras mutations might be to concurrently inhibit SGK-1 activity, thereby blocking energy production, and restore the ability of PHLPP1 to cause cell death. The research was supported by Schafer’s Research Scholar Grant from the American Cancer Society and by a grant from the Phi Beta Psi National Project. The lead author on the study was Joshua Mason, a doctoral student in biological sciences. “This manuscript is really a tour de force that is a testament to Josh’s boundless energy and tenacious work ethic,” Schafer said. The research is described in a paper that was featured in the journal Cell Death and Differentiation and can be viewed here: www.nature.com/cdd/journal/v23/n8/full/cdd201615a.html. Originally published by William G. Gilroy at news.nd.edu on August 18, 2016.